At last the shelved second MU album gets a release eight years after it was recorded. Merrell took the tapes that had been engineered on Maui by Barry Mayo and mixed them at E.C.R. Studios in Emerald City for the Italian label Appaloosa. 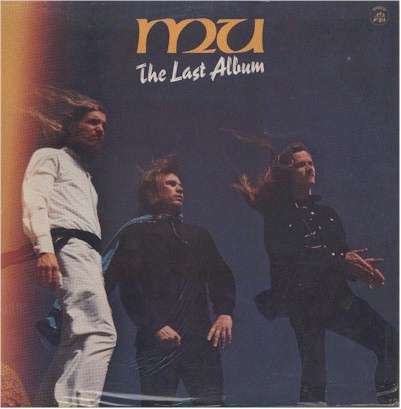 As can be seen above the cover was the wonderful 'hair blowing in the wind, heroic pose' photograph showing Randy, Merrell and Jeff. It's likely Jeff Parker took the shot which explains his absence although he plays bass on the album. There is a picture of all four of them, smiling, outside their Maui shack on the back cover, along with pictures of sheet music to Make A Joyful Noise and On Our Way To Hana, a map of the continent of MU and a psychedelic design incorporating Mu symbols (for a possible album cover?). Mary Lee, who features on violin isn't pictured (maybe it's her behind the camera?). The CD release is packaged in a solid card gatefold sleeve using the same front as the original vinyl; the back cover just gives track information. Inside there is a brief run through Merrell's career, plus the same illustrations from the vinyl's back cover. It's always good to have extra tracks but as these cover such a spread of time they do not all fit so well with the original 14 tracks. The Interview with Lew Irwin (the Earth News interview), Daybreak Sunshine, Showering Rain and You're Not The Only One are contemporary with the Maui tracks and will be familiar to most fans already. Raga Bill and Oceans Of Intelligence are the closest in feel to the others and may also originate from around 1974/76 timeframe but are Merrell solo songs. Red House was recorded live in 1991 and includes Nicky Hopkins on piano while All Along The Watchtower (credited to J. Hendrix - I wonder what Dylan thinks of that?) was recorded in 2002 along with Merrell's new partner Yoriko. Jeff Cotton hasn't been given writing credit for Too Naked For Demetrius.